Maps are free. We welcome you to put them in your place of business, share them with friends and family, distribute them to schools and libraries. We can also create a Watershed Learning Map for your watershed. How has water formed the Watershed? Rivers and tributaries function as arteries in a hydrological system. The Carmel River headwaters begin approximately at 4,080 feet in the Santa Lucia Range just below the Pine Ridge Trail in the Ventana Wilderness. Hiking towards Pine Valley from Church Creek Divide, small, visible springs give genesis to larger downstream flows. Side streams come in from the east off Miller Ridge and from the west higher up near Divide Camp. As the water moves downstream creaks flow from the eastern, northern, and southern areas of the watershed to meet the main stem of the river. During very wet winters, many other canyons of the watershed carry streams which eventually meet the Carmel River. In the lower valley, the river loses speed. It deposits cobbles, gravel, sediment, and plant matter carried from the upper river and tributaries. In the past, when the river slowed down, it tended to widen and meander across the valley depositing rich sediments. Flooding is a natural occurrence of the river. However, homes and businesses built in the flood plain now restrict the natural movement of the water. 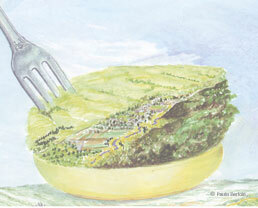 It is through the natural hydrological system that the watershed has been and is continually formed. At the same time, the river is influenced by human actions on the surrounding land. Riverbank vegetation of willows, cottonwoods, and sycamores provides rich wildlife habitat for birds, fr ogs, insects, and many mammals. Birds aid in pollination of plants as well as help spread seeds and manage insect populations. Migrating songbirds such as the olive-sided flycatcher, black-headed grosbeak, yellow warbler, Swainson's thrush, song sparrow, and warbling vireo all depend on riverbank vegetation for food, nesting, and protective cover from predators. The yellow warbler, warbling vireo, and yellow-breasted chat are threatened by the parasitic brown-headed cowbird which steals nests away from those native birds. Preservation of riparian habitat is essential for the well-being of animals that depend on it. 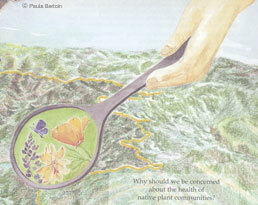 Why should we be concerned about the health of native plant communities? Native plant communities have evolved over thousands of years to provide the richest biological diversity, from the fungi, microbes, and wildflowers to the perennial bunch grasses, chaparral, and trees whose roots reach deep into the soil. Plants provide oxygen and filter toxins out of the water we drink. Native trees that grow near the river and in the hills and valleys of the watershed- such as the California buckeye, white oak, big leaf maple, black cottonwood, bay laurel, and alder- provide shade in the spring and summer. Leaves that fall in the summer and autumn provide shelter and food for insect larvae, which, in turn, are food for fish and birds. 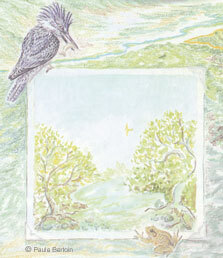 The fish and birds help to fertilize the land. The disappearance of species from an ecosystem, whether caused by the invasive monoculture of non-native plants or by direct removal as a result of development, is a break in the web of relationships. Humans are a part of this web and depend on its integrity. RisingLeaf Watershed Arts is a 501(c)(3) public benefit	organization. Contributions are tax-deductible in accord with California	and IRS regulations.